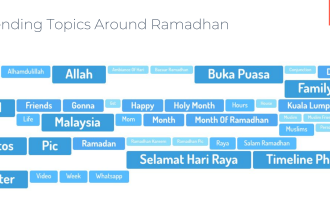 “Buka puasa“, “family”, “Selamat Hari Raya“, “Allah”, “Malaysia” and “photos” were among the list of trending topics surrounding Ramadan this year. 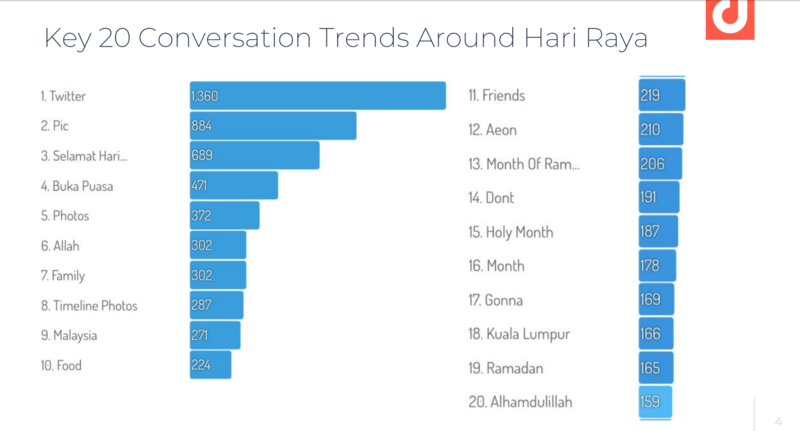 Meanwhile, topping the list of conversation trends around Hari Raya this year were “Twitter”, which garnered 1,360 conversation, and “Pic”, which had 884 conversations. “Selamat Hari Raya” and “buka puasa” also made it to the list. This was according to statistics from Digimind, which monitored Twitter, blogs, Facebook, Instagram, news and forums in Malaysia from 16 May to 14 June 2018. 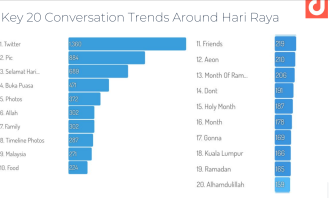 Digimind also noted a steady increase of Hari Raya and Ramadan-related discussions in Malaysia between 16 to 28 May 2018, peaking at 13 June 2018 at 1,045 mentions. It added that key conversation trends include Hari Raya greetings, expressing anticipation at gatherings with family and friends, brands publicising promotions or extended opening hours during the long weekend, as well as netizens and news outlets discussing “buka puasa” plans. The double tears laughing emoji was used by netizens to joke on Twitter about minor inconveniences during Ramadan, such as temporary disruption of sleeping schedules, waking up in time for sahur, and tiding over the initial days of fasting. Conversely, the crying face emoji was used to grouse about the above mentioned inconveniences. The heart emoji was used to express joy at meeting with friends for iftar or overwhelming emotions felt during a time of spiritual cleansing. Meanwhile, prayer-related emojis like the crescent, star and folded hands were among the trending emojis during the period. In the meantime, statistics according to Meltwater showed that the general trending themes for Raya are “Ramadan”, “Dear Anonymous Saudi Prince”, “Ramadan Kareem Your Highness”, “Maybank Acc” and “Bank”. Several brands have also launched Hari Raya-related campaigns in the lead up to the festive season. Some of the trending topics include “Jom Raya app”, #MisilkhlasAidilfitricampaign, “Good job TNB”, #RayaBestsama and “SekawanBefore”, according to Meltwater. Ranging from touching to humorous, let us take a look at some of the Hari Raya campaigns this year. “Brands continue to leverage cultural touchstones to connect with their audiences, resulting in positive sentiment generated across various campaigns. With festivals as culturally rich and nuanced as Ramadan, it is important to deploy a healthy dose of understanding and empathy so that messages resonate and respect the spirit of the season,” Mimrah Mahmood, APAC regional director, Media Solutions, Meltwater, said. CIMB Malaysia aims to reinforce its brand message of inclusion and strength through diversity with its Raya short film “Tanam Cempedak Tumbuh Nangka“, which presents a Malaysian tale that is “truly sweeter” than cempedak. When a cempedak tree nestled between three homes bears a single plump fruit, it sparks off a disagreement on who lays claim to it. The three protagonists can’t seem to see eye-to-eye but are finally taught forgiveness and the value of community by an unlikely figure. The campaign is being housed entirely on social media, where viewers can watch the film and continue the mystery of the cempedak in a 360-degree on CIMB’s Facebook page. Fans and followers can even make their guess in pantun form and stand to win IKEA vouchers. 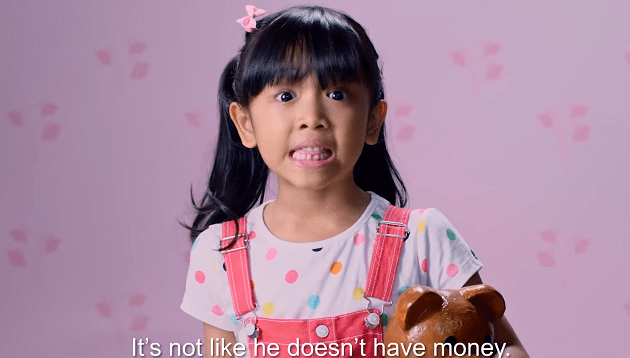 Hong Long Bank’s three-minute video titled “Abah Tak Bagi” tells the story of how a young girl is taught the value of saving by her “cheap and stingy” father. Much to her disdain, the young child’s requests for expensive items are met with cheaper, albeit quirky, options by her well-meaning and resourceful father. According to Domenic Fuda, group MD and CEO of Hong Leong Bank, the devotion of parents, regardless of generation, towards their children’s futures, had inspired the bank in developing its Hari Raya campaign theme “Menyemai Impian” (Sowing Dreams). Tenaga Nasional’s (TNB) “Rumah Epik Fantastik” spot, which features the male protagonist Arif dreading Raya and calling it “A week without privacy”. True enough, it gets rather chaotic at home when his relatives arrive and his room is in a mess. But despite this, Arif is grateful that there will always be enough food at the table for his family and relatives each Raya. The company wanted to highlight the excitement, mayhem and magical moments of the festive season, viewing it through the lens of Arif. The film takes the viewer on a feel-good journey, with values of tolerance, compromise, togetherness and unity, all of which mirror the brand values that TNB wants Malaysians to reflect on this festive season. Netflix dished out some valuable life lessons with a comic encouraging consumers to “keep calm and carry on” when life gives them lemons. The comic featured quotes from Netflix originals such as Stranger Things and The Unbreakable Kimmy Schmidt, urging consumers to “Smile until [they] feel better”, and that as long as one has his or her family, that person is home. It also created an original pantun (a Malay poetic form) and a video to celebrate Hari Raya. The automotive company launched its first ever Hari Raya campaign “Jalan Cerita” (which means storyline or road story), focusing on the tales of Toyota drivers throughout their lives. The spot aims to push the message that no matter where their “Jalan Cerita” takes them, Toyota is there at every step of the way. The film starts by telling a story of protagonist Afiq’s bond with his father, as he narrates about his childhood. Afiq explains that his father is a simple man, always insisting on going “jalan-jalan” (let’s go for a ride) after work in his liteace van. Unfortunately, Afiq eventually grows bored of going “jalan-jalan” everyday, and driving around the neighbourhood without actually going anywhere. The airline’s Hari Raya video revolves around the theme of Malaysian hospitality, telling the story of a little boy who plans to welcome a new family member from a different race, who is celebrating Hari Raya with them for the first time. With the help of his neighbourhood friends, he surprises the family with an extravagant display of lights, and learns that the smallest gestures can make the most memorable hospitality. “Our hospitality is a reflection of the combined values of unity, tolerance and warmth which cuts across the multi-cultural races of Malaysia. These values lie at the heart of this short film,” Izham Ismail, group CEO, Malaysia Airlines, said. U Mobile took on a different approach to Hari Raya with an unconventional Raya song for its “Raya Bestsama” spot, featuring local rapper Aman RA. “Raya Bestsama” is a play on the word “Bersama” which means “together” – but even better – hence “Bestsama”. The music video revolves around the good old boy-meets-girl storyline and garnered more than 7.8k reactions, 353k views, 1.8k shares and 367 comments, as well as 561,821 YouTube views at the time of writing. SP Setia’s Raya campaign embodies the message “Setia di samping mu” (Faithfully, by your side), in a bid to resonate with Malaysians and ensure they are able to embrace the message regardless of race. The video seeks to promote a deeper understanding of each other’s culture and beliefs. As such, it brought to life the story of a samping, which is mainly seen as a fashion statement. The video, which garnered over 1 million views, 14k reactions, 4.1k shares and 325 comments at the time of writing , unearths the wonders that the samping holds within, such as hidden values, forgotten purposes and lost meanings. MSIG Malaysia’s video titled “Anyaman Kasih” (weave of love), is inspired by a true story and based on a Malay poem. The story of the video follows the traditional preparation of the Hari Raya delicacy “Ketupat Palas”. This is accompanied by the narration of a Malay poem specially composed to recount the hard work, care and love that goes into its creation. While most people are familiar with the final product, many are unaware of the amount of work and difficulty that is involved in the harvesting of the daun palas (leaves) and preparing (weaving) the final special Raya delicacy. KFC Malaysia’s Raya film is based on the notion that fights within families are unavoidable. It focuses on the quiet act of a Salam, which expresses the message “Maaf Zahir Dan Batin”, a message the fast food brand wants to extend to Malaysians everywhere this season. The spot centres around the idea of forgiveness during Raya and features two brothers who go on a journey to repair their relationship during the festive season. The video also explores their relationship growing up and what it is in current times. This year, Digi partnered with NagaDDB Tribal for a campaign featuring former national footballer, Nidzam Jamil, which aims to find inspirational content and drive the importance of good intentions. The film tells a true and heartfelt story of how Nidzam faced multiple setbacks, such as the loss of his elder brother and an injury that cost him his career. With a helpful reminder from his brother that all good things begin with a good intention, Nidzam manages to rise back onto his feet and start over. The bank’s “Berkat di sulam, bantuan diberi”spot sees the its challenger spirit manifest in two characters – the everyday heroines who keep striving for a better life, and those who selflessly devote time and effort to provide a helping hand when need, in this case Padzilah Enda Sulaiman the founder of Telekung Siti Khadijah. In the spot, a working mother is seen taking up a sewing job at Telekung Siti Khadijah, and eventually picks up a new skill to provide for her family. At the time of writing, the spot garnered 904K views, 4.2k reactions and 412 shares. Watsons Malaysia’s six-minute film, which was launched as part of its#MisiIkhlasAidilfitri campaign, aims to spread positivity and shine a light on the kind and sincere acts performed by Malaysians every day. The film features the protagonist Munira, a renowned TV presenter, who is haughty and mean to those around her. However, she slowly discovers that beauty is not only reflected via one’s looks, but also from the goodness of one’s heart. Pos Malaysia unveiled 3D hologram greeting cards for the upcoming Hari Raya Aidilfitri celebrations after it witnessed success with last year’s AR Raya postcards. According to group CEO Al-Ishsal Ishak, Millennials are on the look out something different that breaks through the clutter of texting and using social media. Pos Malaysia constantly challenges itself to make its consumers’ experience unique and different, and the new 3D hologram greeting cards demonstrate its “ongoing commitment to innovation”. Do you have a favourite Raya ad? Share it with us a janicetan@marketing-interactive.com. iflix initially believed that the Western entertainment model could easily succeed in emerging markets, and that price would be th..